The gaping “To Be Announced” hole in the 2008 NHRA POWERade Drag Racing Series schedule has finally been filled. To the surprise of absolutely nobody, the September 11-14 event will be held in Charlotte, N.C., at the new “Dragway At Lowe's Motor Speedway,” which is currently being built by Speedway Motorsports Inc. As a result of recently announced modifications to its Countdown to the Championship, the new NHRA Carolinas Nationals will begin the post-season playoff schedule. The quarter-mile strip will join Lowe’s Motor Speedway’s 1.5-mile superspeedway and 4/10ths-mile dirt track. Preliminary grading is underway, and construction on the grandstands will begin in early February. The dragway will be located on 125 acres of property across U.S. Highway 29 from the superspeedway, adjacent to The Dirt Track. The track, pit areas and midway will cover 46.5 acres, or two million square feet. Engineers estimate construction will require moving 750,000 cubic yards of dirt; placing 65,000 tons of stone and laying down 50,000 tons of asphalt. NHRA Funny Car star Ron Capps will join us at 4 p.m. ET this afternoon to talk about the new track. "Pepsi Steve" has been at it again! Looks like we're wheelin' a Whelen Modified this week. Thanks Steve! One Last "Godfather's Elf," Just Because She's SO DARNED CUTE! Allie Kate is a fairly new Sirius Speedway listener, but already has strong negative feelings aboout the Top-35 rule. They're Laying Down The Asphalt At Darlington Raceway Today! 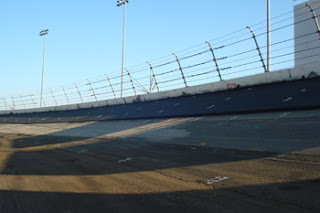 The new asphalt surface at Darlington is part of a $10 million dollar capital improvement project that began following the 2007 Dodge Avenger 500. In addition to the new racing surface, work is also underway on a new infield access tunnel large enough to accommodate race car haulers, motorcoaches and emergency vehicles. Preseason testing wrapped up for the NASCAR Craftsman Truck Series at Daytona International Speedway yesterday, with Roush-Fenway Racing’s Erik Darnell recording the fastest overall speed at 178.547. Scott Lynch, Mike Skinner, Justin Marks and Stacy Compton completed the Top-Five. Schrader Finds A Ride: BAM Racing will field a Dodge Charger for veteran Ken Schrader in both the Bud Shootout and Daytona 500, with David Hyder as crewchief and engines by Gillett-Evernham Motorsports. Schrader is in attendance for the second round of Sprint Cup Series testing -- which began this morning at the World Center of Racing -- and confirmed that he will drive for BAM at Daytona, and in tests at California and Las Vegas later this month. Wood Brothers Racing co-owner Eddie Wood told Sirius Speedway last week that Schrader could still drive a limited number of races in the #21 Ford, but that there is currently no sponsorship in place to make those plans a reality. In a related story, the Wood Brothers and JTG Racing owner Tad Geschickter have stepped back from the full partnership they have enjoyed over the last two seasons. The teams will continue to work together on marketing and technology, with Geschickter overseeing sponsor procurement for both operations. The teams will now have separate operating budgets, however. Wood Brothers Racing will field the #21 Sprint Cup Ford with drivers Bill Elliott, Jon Wood and Marcos Ambrose, along with the #21 NCTS Ford for brothers Jon and Keven Wood. JTG Racing will field a #47 Little Debbie-sponsored Sprint Cup Ford in four races for Ambrose this season -- at Indianapolis, Kansas, Atlanta and Homestead -- full-time Nationwide Series cars for Ambrose and Kelly Bires, and a NCTS entry for Scott Lagasse Jr. The teams will continue to work out of their 120,000-square foot shop in Harrisburg, N.C.
Frye To Red Bull Racing: Red Bull Racing Team has hired former Ginn Racing General Manager Jay Frye to serve as its new GM, effective immediately. 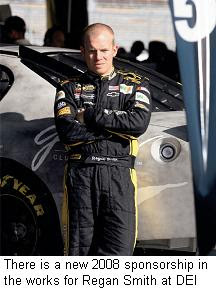 Frye has 16 years of experience in the NASCAR industry, most recently as CEO and GM of Ginn Racing and MB2 Motorsports for the last 12 years. He fills a hole left when Marty Gaunt left the team in June of last year. New Sponsor For Smith: It appears that Principal Financial Services will serve as one of the sponsors for Dale Earnhardt Inc.’s #01 Sprint Cup Chevrolet, driven by Regan Smith. Smith tested the car this morning at Daytona International Speedway in a Principal Financial Services uniform, with the company’s logo on the rear quarterpanel of the car. DEI President Max Seigel said DEI has a letter of intent with Principal Financial for a 2008 sponsorship relationship of some kind, but that details are still being negotiated. Mark Martin said yesterday what most drivers almost certainly think in private; that a full day of single-car testing at Daytona International Speedway serves no useful purpose. Martin also revealed that Dale Earnhardt, Inc., is negotiating to sign motocross star Ricky Carmichael to run for the Camping World East Series championship this season. Martin has worked with Carmichael in his short-track efforts with the former Ginn Racing. Jason Keller is testing the Gillett-Evernham Motorsports' #98 Dodge at Daytona this week, under the watchful eye of test team director Pete Rondeau. Gillett-Evernham General Manager Keith Barnwell said the car will run a limited schedule of events again in 2008, with no driver locked in yet. It will not be a part of upcoming tests at Las Vegas and California. Despite widespread reports that there are a pair of sponsors in the pipeline at Yates Racing, Travis Kvapil tested two cars at Daytona yesterday clad only in orange numbers, the Yates Racing logo and the website sponsoryates.com. The website included a letter from team owner Doug Yates saying the team still has primary sponsorship opportunities available on both cars. In a related story, Kvapil announced yesterday that he will not compete in the Nationwide Series for Roush Fenway Racing, after all. The team had planned to run Kvapil in the full Nationwide Series schedule, but the effort has now been scrapped due to lack of sponsorship. McGill Motorsports will not compete in the 2008 Nationwide Series, due to lack of sponsorship. Crewchief Ricky Pearson confirmed that the independent team will take the year off, after team owner John McGill declined to continue funding the team out of his own pocket. Pearson said McGill Motorsports has sold off some of its equipment, but is still searching for a sponsor to return to the track in 2009. AAA will end its NASCAR sponsorships at the end of this season, withdrawing as primary sponsor of David Ragan’s #6 Roush Fenway Racing Ford, and the official auto insurance of International Speedway Corporation. Their departure could clear the way for Nationwide Insurance -- the new sponsor of the series formerly known as the NASCAR Busch Series – to become the official auto insurance for ISC’s 19 speedways around the country. Nationwide already serves in that capacity at the Speedway Motorsports Inc. tracks. The moves reportedly came after complaints from AAA Auto Clubs located away from Sprint Cup events. Those regional clubs said they do not receive sufficient return on their investment, prompting AAA to let the individual clubs make their own sponsorship choices from now on. That decision could bode well for February’s Auto Club 500 at California Speedway, AAA’s “Official Motor Club” status at Dover International Speedway, and its sponsorship of the May Craftsman Truck Series race there. "Pepsi Steve" And The Sirius Speedway Racing Team Are Ready To Roll! 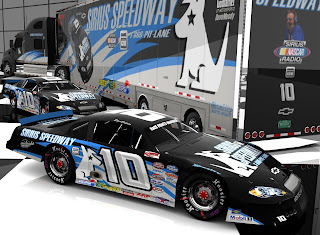 After a long winter of work, Steve Buhala and the #10 Sirius Speedway Racing Team are ready to hit the track with two new Chevrolet Monte Carlo Late Models and a state-of-the-art transporter. An up-close look at Steve's potent #10 Sirius Speedway Chevrolet; coming soon to a Victory Lane near you. 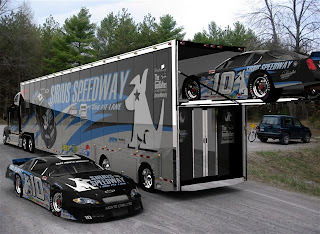 The new Sirius Speedway race truck is also a looker. U.S. District Court in Kentucky granted summary judgment in favor of International Speedway Corporation and NASCAR today, dismissing the Kentucky Speedway antitrust lawsuit in its entirety. This brings an end to Kentucky Speedway’s effort to litigate its way onto the NASCAR Sprint Cup Series schedule, and establishes -- once and for all -- NASCAR’s right to determine when and where the sport will compete. 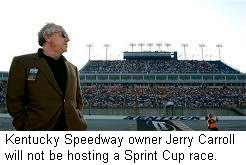 The suit alleged that ISC and NASCAR had worked together to prevent Kentucky Speedway from acquiring a NASCAR Sprint Cup Series race. But in an opinion issued this morning, U.S. District Court Judge William O. Bertlesman ruled that even if he gave Kentucky Speedway the benefit of the doubt on all of its allegations, the track had failed to make a case. NASCAR and ISC had asked for that summary judgment in an effort to avoid a trial scheduled for March. Kentucky Speedway has the right to appeal the ruling. International Speedway Corporation Executive Vice President and COO John Saunders will joins us live today at 3:30 p.m. ET to discuss the case, along with a spokesperson for NASCAR. We are also hoping to speak live with a representative of Kentucky Speedway. McClure: "We Don't Have A Thing." 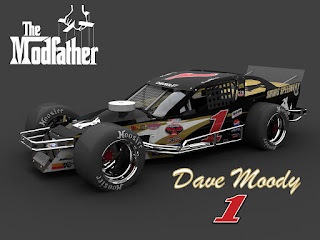 Morgan McClure Motorsports General Manager Larry McClure has confirmed what Sirius Speedway first told you early last week; that State Water Heaters will not return to sponsor the team in 2008. In addition, McClure says Ward Burton will likely not return as driver. Haas CNC Racing driver Scott Riggs told Sirius Speedway Friday this his new team is in negotiations to put State Water Heaters on the side of his #66 Chevrolet this season, and McClure said this weekend that he believes the move has already happened. "Right now, we don’t have a thing,” he said. “It must have been an instant decision, because we had no idea it was going to happen. We found out before Christmas, and it became official after the holiday.’’ McClure said Burton “probably won’t be back," adding, "we’re looking at using either Mike Wallace or P.J. Jones for testing, and we will go from there." McClure sad he is looking for a driver who can bring sponsorship to the team, and is negotiating with a major Sprint Cup Series operation to serve as a “satellite team,” sharing information in 2008. The deal is contingent on sponsorship, however. Lucas Oil will return as an associate sponsor in 2008, but McClure said more is needed to make a full the 2008 season happen. "We’re just going to see how much money we get in the door,’’ he said. "We’re not going to race on our own money anymore." Kahne Pleads Not Guilty: Kasey Kahne pleaded not guilty to misdemeanor battery charges stemming from an incident with a security guard at Homestead-Miami Speedway on November 16th. The written plea was filed last Thursday, and cancels an arraignment scheduled for tomorrow in Florida. Kahne has hired Richard Sharpstein -- the attorney representing the family of murdered Washington Redskins safety Sean Taylor – to represent him in the case. The speedway security guard claims Kahne pushed him to the ground, causing injuries that have left him unable to work. Kahne's representatives say the Sprint up Series driver was simply pushing the guard's hands off him. 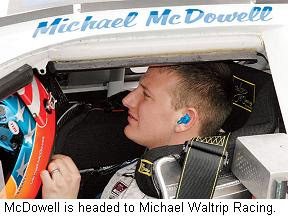 McDowell To MWR: 2007 ARCA Remax Series runner-up Michael McDowell will succeed David Reutimann in the #00 Sprint Cup car at Michael Waltrip Racing. McDowell will take over the #00 Toyota in late March at Martinsville Speedway, when Reutimann moves to the #44 UPS Toyota being vacated by Dale Jarrett . 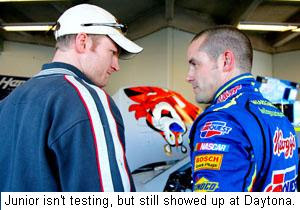 MWR tested both McDowell and Josh Wise extensively during the offseason, with McDowell apparently getting the nod. 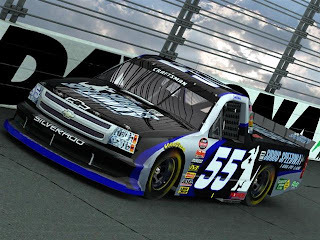 Wise could end up in a Nationwide Series ride this season, if sponsorship can be found. A formal announcement from the team is expected in the near future. 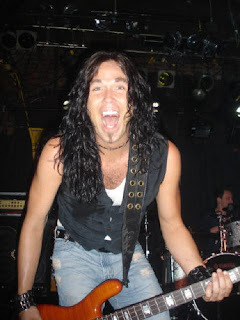 Billy Ray Cyrus' bass player, NOT the Sirius Speedway host, or the Dove Award-winning gospel singer. MRN Radio's Rich Culbreth -- Our Beloved Board Op -- Was The Mullet King! It's just too horrible not to be true! Don't look straight at him, or you'll turn to stone!